Pro Pharma Launches JCode Calculator™ 3.0 – a Standardized Injectable Fee Schedule to assist with management of claims payment of injectables, vaccines, immunizations, cancer therapeutic agents, and enteral feedings. Pro Pharma's JCode Calculator™ bases all injectable reimbursement on the Healthcare Common Procedure Coding System (HCPCS), defined units, priced utilizing a spectrum of pricing metrics and can be customized for drug category discounts or multiple discounts based on drug type or specialty. 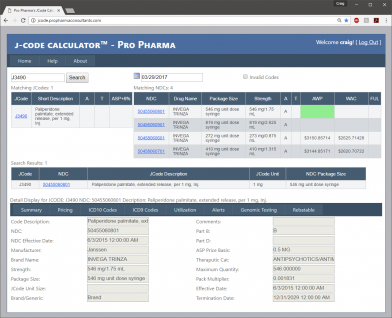 "We are thrilled to be able to provide these enhancements to JCode Calculator™," says owner and CEO of Pro Pharma, Carol Stern. "Our development team took the best parts of JCode Calculator™ 2.0, and with our customer's needs in mind, expanded the tool to truly be an indispensable resource for those in claims payment, quality, management and billing." Pro Pharma has been providing quality service and products to the pharmaceutical and medical industry since 1986. The company revealed that since its beta-testing Pro Pharma's JCode Calculator™ 3.0 has received praise for its expansive content. "Although this version of JCode Calculator™ has more content, more features and is more user friendly", states President of Pro Pharma, Craig Stern, "we strive to continually improve the end-user experience, with updates and additions." To learn more about Pro Pharma's JCode Calculator please contact us at info@propharmaconsultants.com, call us at (888) 701-5438 or visit the website at http://www.propharmaconsultants.com. Pro Pharma's Consulting services are grounded in the use of data and the communication of that information to define benefit trends, drivers and other analytical indicators. Pro Pharma markets Biotech Modeling™, Invoice Screening™, Quality Management Program™, and Treatment Calendar™. The Company directly markets its products in the U.S. and collaborates with partners to reach international markets. For more information about PRO PHARMA, please visit www.propharmaconsultants.com.